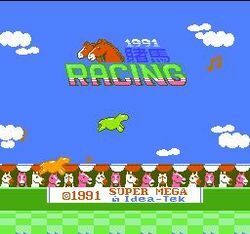 1991 Du Ma Racing is an unlicensed horse racing game for the NES that was developed by Idea-Tek and published by Super Mega. The game offers two game modes. In race mode, two players can compete in a race. By pressing a button at the right time, they can build up their horse's power, then press another button to release it and give their horse an edge in the race. The player who does this faster and more accurately will have a better chance of winning the race. In gamble mode, 1 to 6 players start out with 500 credits to place bets on 5 horses. The race will be simulated without any player interaction, and at the end of each race event players will get their respective prize money. The goal is to earn more money this way than any other player. This page was last edited on 25 June 2014, at 17:22.